After the banking collapse of 2008 as a measure to combat the growing liquidity crisis there began a global push by Governments, Central Banks and Multinational Companies to eliminate the use of physical cash around the world and replace it with digital money. This movement is often referred to as “The War on Cash”. Once every year these elite bankers, leaders in business and government meet at the World Economic Forum meeting held in Davos, Switzerland where they chart out the future course of the global economy. Immediately after the conference in January last year, there was a big acceleration to eliminate paper cash, or at least high-denomination currency notes worldwide. Experts have alluded to this secret meeting for kick-starting the Global War on Cash. 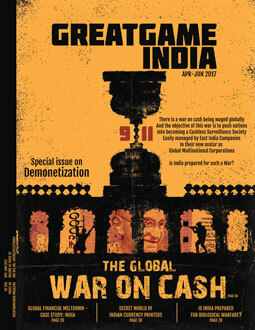 This article is part 4 of the Global War on Cash Series published in the Apr-Jun 2017 Demonetization issue of GreatGameIndia. Previous parts can be read below. Due to the patriotic loans turned bad loans becoming NPAs being wrote-off in massive amounts the Indian banking industry came into a crisis of liquidity. Simply put part of the Global (mostly North-Atlantic) Liquidity Crisis was now transferred to Indian banks courtesy of India Inc. In February last year (2016) after the asset quality review (AQR), was started by the Reserve Bank of India (RBI) it was revealed that there was nearly a 70 per cent surge in non-performing assets over the past six months alone. The US based bond rating company Moody’s Investor Service immediately cautioned the Indian government that if it did not boost the capital levels of PSUs by revising its capital infusion plan for the public sector banks in the upcoming budget, the banks will see negative ratings. Rating 11 state owned banks in India Moody estimated an external capital requirement at the tune of Rs 1.45 lakh crore for the four financial years, ending March 31, 2019. India criticized Moody’s ratings methods and pushed aggressively for an upgrade, correspondence between India’s finance ministry and Moody’s have shown. Rejecting those arguments, Moody’s said India’s debt situation was not as rosy as the government maintained and its banks were a cause for concern. Interestingly of the Rs 1.45 lakh crore projected by Moody’s, Rs 1.14 lakh crores had been written off by PSU banks in the last 3 years alone. Following the directive the Indian government announced a series of major banking reforms, including lowering its stake in state-owned banks to a staggering 51 per cent. Under these banking reforms PSB mergers are a top priority, inspite of nationwide protests from the bank employees of each of these banks. For these reforms the proponents of privatization raise the issue of productivity in the PSBs. However what they fail to mention is that these were the same Rating Agencies and Banks whose fraudulent policies of the sub-prime housing mortgage collapsed the entire US economy. Now these same banks are lining-up to buy Indian PSBs. Again the question is where is all the money coming from in these bankrupt banks in the first place? A recent study by Care Ratings for The Indian Express found that the gross “non-performing assets” of state banks rose 56 percent in 2016, and 135 percent in the last two years alone. A perception was created that the entire Indian banking was heading for a collapse and if nothing was to be done immediately it could along with it crash the entire economy as well. This is the background under which an attack on cash was launched through Demonetization; this is how the Global #WarOnCash reached India. After the conference, the CEO of Deutsche Bank John Cryan called for the elimination of cash and predicted that cash won’t exist in 10 years followed by Norway’s biggest bank, DNB. Mario Draghi, head of the European Central Bank (ECB), announced that he has essentially decided to phase out the €500 note. Larry Summers, a Harvard professor and former Treasury secretary, wrote an article in The Washington Post titled “It’s time to kill the $100 bill.” Summers became the latest high-profile “economist” to call for the abolition of cash. Same sentiments were echoed by leading media houses with the editorial board of Bloomberg publishing an article titled “Bring On the Cashless Future” along with Financial Times op-ed titled “The Benefits of Scrapping Cash” and editorial board of The New York Times joining in with “Getting Rid of Big Currency Notes Could Help Fight Crime.” Peter Sands, president emeritus of Harvard, issued a paper titled “Making it Harder for the Bad Guys: The Case for Eliminating High Denomination Notes.” Hasbro, maker of the Monopoly board game, announced that, starting in the fall, the famous game will no longer feature cash. The company is replacing in-game cash with special bank cards players can scan on handheld “banking units” to make purchases. Than on 9/11 2016 shots were fired in India as well. The Indian story is an extreme example of the firepower behind the War on Cash with over 100 reported deaths.